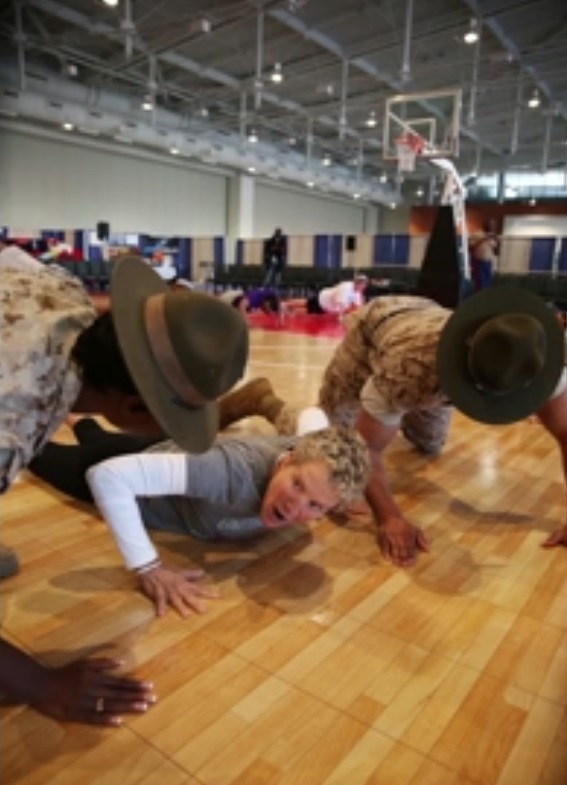 Drill instructors got in the faces of women’s basketball coaches this week during an annual conference to teach them how to promote leadership and unit cohesion through physical fitness. Drill instructors yell at Beth Bass, chief executive officer of the Women’s Basketball Coaches Association, during their annual conference. Members of the Marine Corps Recruiting Command attended the 2014 Women’s Basketball Coaches Association National Convention in Nashville, Tenn., from Saturday through Tuesday. Drill instructors led a morning workout with coaches from high schools to collegiate programs of all divisions, according to a Marine Corps news release. The association gathers to network with established leaders, like those in the Marine Corps, while continuing to enhance and develop their athletic skills. During the on-court demonstration and coaches workout, the Marines and athletes were able to nurture traits they both share, according to the release. Last year, one coach was especially motivated by the Marines at the conference. After attending the 2013 conference, Nikki Caldwell head coach of the Lady Tigers basketball team at Louisiana State University — a perennial Division I power — called local Marine recruiters to hold physical training sessions with her team. Caldwell said the Marines related their ethos as warriors to what the basketball players do on the court. The Marines want to win the nation’s battles, and her team wants to win on the court. And just as the Corps seeks to create quality citizens, LSU wants to make quality student athletes, she said. “When they started showing us the parallels between the two entities, I think it was very moving for our team to see that,” she said. Watch this video for more on how MCRC is motivating the athletic community.